I've always heard about Joey Gathright's great speed and natural athletic ability. However, I've never seen the Urban Legend about Gathright. It's been rumored that he can jump over cars. Well, I stumbled across this video from mdillon23 and now we know the Legend is true. See for yourself. The Reds are always in need of a leadoff hitter and Gathright might fit the bill rather well in the future. Typically, I don't find a significant amount of value to the written content on MLB.com. As the official site of Major League baseball, it typically doesn't provide the most objective of content. However, as of late, I have found a few articles of note on the Washington National site. One of the real absurdities in baseball today is that Barry Larkin isn't working for the Reds organization. Throughout baseball history, star players who spend their entire playing career with just one organization are very rare. Babe Ruth, Ty Cobb, Willie Mays, and many others played with multiple organizations. In the free agent era, it's even more rare. It requires a bit of give-and-take from both the player and the organization and a healthy dose of luck. 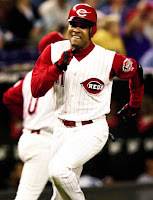 However, despite the odds, Barry Larkin and the Reds managed to do just that. Unfortunately, no sooner had he hung up his spikes, then he was off to work for former GM Jim Bowden in the Washington Nationals organization. Rumor has it that Larkin would not work in the same front office with John Allen, who for years stood in the way of efficient and effective front office dealings in Cincinnati. Larkin's departure is not just unfortunate from a sentimental standpoint, but also from a business standpoint. When he left for Washington, Larkin took a lot of wisdom and experience with him, wisdom that certainly could have benefited the Reds. The stories from the MLB National site reveal just what the Reds are missing. Larkin has spent a significant amount of time mentoring and teaching the players in the National's organization, which is something that the Reds could use given their renewed focus on player development. Here's a recent article about Larkin mentoring the troubled Elijah Dukes. WASHINGTON -- A few days before the Winter Meetings started in Nashville, Tenn., Nationals general manager Jim Bowden called Barry Larkin, his special assistant, to ask if Larkin had ever heard of Rays outfielder Elijah Dukes and was he aware of the slugger's troubled past. Larkin told his boss that he never heard of Dukes. Bowden was looking to acquire Dukes in a trade and the Nationals already had a plan in place to make sure Dukes didn't have any problems on and off the field. One of the ideas was to have Dukes work out with Larkin in Orlando before Spring Training started. Larkin didn't hesitate. He agreed to be one of Dukes' mentors. After being traded to the Nationals for pitcher Glenn Gibson on Dec. 3, Dukes and Larkin have been working out together ever since. Besides showing plenty of support, Larkin has been teaching Dukes the mental side of hitting. As the season goes on, Larkin will be a sounding board for Dukes, and the topic doesn't necessarily have to be about baseball. "It's a matter of showing this guy some love. That makes for a very healthy environment to compete and do well regardless of what your personal issues are or may have been," Larkin said. "He smiles when he is here. I think he really enjoys it. I want him to be ready for Spring Training and be in shape. This guy is a physical monster -- strong, fast, quick and all that kind of stuff. He is a stud." After watching Dukes, 23, work out and hit, Larkin believes that Dukes could be a 30-30 player one day. "Physically, he is strong enough to hit 30 to 40 home runs. He's probably fast enough to steal 30 to 40 bases. Physically, this dude is gifted," Larkin said. "I think it will be important that he feels like part of [the team] early as it is with any young player that has been traded." Being a mentor is nothing new to Larkin. As a starting shortstop for the Reds, he was a big brother to players such as Dmitri Young and Austin Kearns. Larkin learned to help his teammates by being around Pete Rose -- his first big-league manager -- Tony Perez, Buddy Bell, Ron Oester and Dave Parker. "I'm a product of my environment," Larkin said. "I came up with some incredible people, who were not just baseball players, but actual teachers." Larkin's teachings have paid off. Besides working with Dukes, Larkin taught third baseman Ryan Zimmerman the proper way of playing shortstop. Whenever manager Manny Acta had the shift on a left-handed hitter such as Carlos Delgado, Zimmerman played short and was smooth turning the double play. "He sent me a text after making a double play. He said that position might be the easiest position on the field to play," Larkin said. Larkin wasn't just a tremendous player, but he also has an innate understanding of the game and the ability to impart that knowledge. Last year, Larkin replaced Harold Reynolds as an ESPN analyst on the College World Series broadcasts and provided a significant amount of insight. During one of the games, Larkin talked about the need for players to focus on "winning each baseball event, not just the game itself." 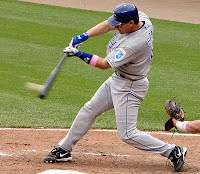 For example, during an at bat, hitters should "win" each pitch in order to win the at bat. He should win each at bat to win the inning. He should win each inning to win the game. That's the kind of philosophy that should permeate the Reds organization, but unfortunately Larkin took it with him to Washington. This offseason, I really wanted to bring Larkin back as the next manager of the Reds, but instead we gave the job to Dusty Baker. It would've been nice to keep Larkin's knowledge and experience in the organization to help our younger players realize their potential and understand how to play the game the right way. "Playing the game the right way" is a phrase thrown around so often that it has almost become a running joke, especially when it's paired with tenets that are so clearly detrimental to the performance of the ball club. But, in Larkin's case, "playing the game the right way" may actually be an accurate description of the knowledge that he brings to the table. In short, it's time to bring Barry home. Today, the Reds signed Josh Fogg to a one year contract worth $1M and tossed him into the mix for a spot in the starting rotation. It's an odd move, as it doesn't improve the Reds in any way, shape, or form. I'm a big believer in risk/reward acquisitions, but while Fogg at $1M certainly comes with low risk, he also has essentially zero upside. Fogg is as good as he going to get, which isn't good at all. All this move really accomplishes is to clog up the 25 man roster and delay the arrival of impact pitching prospects. To me, those seem like the only logical reasons to bring in a stop gap veteran pitcher like Fogg. However, in this case, none of those reasons seem to be applicable to the Reds. Unfortunately, Fogg not only lacks the upside of the Reds pitching prospects (Bailey, Cueto, Volquez, Maloney, etc), but his current baseline production isn't any better than what those prospects would provide in 2008. So, not only does Fogg lack the upside of the prospects, but he doesn't even provide better short run production. So, where's the benefit of bringing him in? 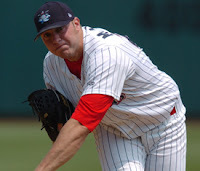 In 2007, Fogg pitched 165.2 innings, posting a 4.94 ERA and a 1.53 WHIP. On his career, he hasn't been much better, posting a 4.90 ERA and a 1.46 WHIP. In addition, Fogg has a career strikeout rate of 4.83 K/9, which is too low for him to be successful. In the modern era, it's difficult to find many pitchers who have maintained consistent success with a strikeout rate below 5.0 K/9. Fogg's low strikeout rate means that he allows a tremendous amount of contact, leaving him at the mercy of the Reds defense, which is never a good thing. Fogg's career performance isn't a result of Coors Field or bad luck, rather he's earned every last ounce of his career stats. He's not a good pitcher and he's not a good option for the Reds. Given the way the modern game treats its young pitchers, it's sometimes advantageous to bring in a veteran pitcher who can handle a heavier workload. There is a school of thought that the risk of injury to young pitchers increases as they tire. As a pitcher tires, his mechanics can break down, which leads increases the susceptibility injury. Veteran pitchers can handle heavier workloads, which can take the strain off of a team's bullpen. If you have a staff with a lot of young starting pitchers, then they likely won't work deep into the game very often, which leads to more appearances and innings pitched by the bullpen. So, there are times when it makes sense to add a stopgap veteran pitcher. However, that really doesn't seem to be the case with Fogg. 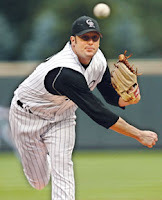 In 2007 for the Rockies, Fogg pitched 163.2 innings in 29 starts, which works out to only 5.2 innings per start. He went 7.0 or more innings only 7 times and his longest start of the year was 7.1 innings. While a rookie pitcher will be limited by strict pitch counts, Josh Fogg rarely works any deeper in the game than they would, so the veteran benefit is negligible at best. It also doesn't make sense that Fogg is in the mix in order to give the prospects more development time. Bailey doesn't have anything left to prove in the minors. Cueto dominated three levels of the minors in 2007. Volquez is 24 years old and has pitched part of three seasons in the majors, so he his development time is in the past and he isn't going to benefit from going back down on the farm. In addition, Matt Maloney is essentially ready for the majors. In essence, our four best pitching prospects are already major league ready, so Fogg is an unnecessary acquisition. Overall, there is no logical reason for the Reds to have acquired Josh Fogg. He is a poor bet for the 2008 season and he would likely be outperformed by each of our top 4 pitching prospects. It has taken years for the Reds to develop homegrown pitching, but now is the time to embrace it. All offseason the Reds have been rumored to be acquiring a veteran starting pitcher, while seemingly having no confidence in their pitching prospects. The future of the Reds will largely be determined by the young pitching prospects, but the Reds need to realize that the future starts now! Despite my very best efforts to keep an open mind, Dusty Baker's early comments deserve a mention and a moment of our time. Unfortunately, there is not much positive to point out in the early going, but there are things about which to worry. Just to recap, when Dusty was hired there was significant rumbling coming from the fan base. People had several concerns about Dusty Baker, which included 1) his history of overworking young pitchers, 2) his penchant for favoring his favorite veterans over younger players, 3) his utter lack of appreciation for the importance of on base percentage, and 4) his inability to handle any criticism. When his hiring was announced, something rather unusual happened. There was a collective groan from the fans and almost immediately Baker had to answer questions from the media about the aforementioned tendencies. I can't recall any other managerial candidate being put on the defensive immediately upon being hired, so it was rather unique. While the media pressure was unusual, it oddly enough gave me a sense of hope about the hire. If everyone under the sun was questioning Baker and his managerial tendencies, then maybe he would feel the need to change his wayward ways. Unfortunately, the season hasn't even started and Dusty's comments reveal that he really hasn't changed a bit. Just for a quick recap, the Reds have Adam Dunn in leftfield, Ken Griffey Jr. in rightfield, and Ryan Freel, Norris Hopper, and Jay Bruce in the mix for the centerfield job. In the past, I had concerns about Hopper's ability to handle the job on an everyday basis, but he's grown on me this offseason. It's hard to deny that he's the best candidate for the job if Bruce isn't ready to hold it down. 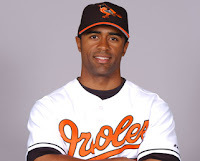 In addition, the Reds are also including Chris Dickerson in the race for the centerfield job, though he's a long shot. Regardless of the fact that the Reds have a couple of quality options for centerfield duty, Dusty has other ideas. SARASOTA, Fla. -- Leading off for the Reds, Kenny Lofton? Lofton is among several free agents still without a team as Major League camps opened for Spring Training. 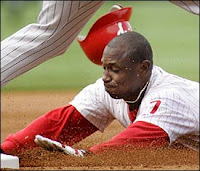 Manager Dusty Baker said on Sunday that he's spoken with Lofton and another veteran center fielder, Corey Patterson. "They're both out there looking for a job," Baker said. "We have to see if it fits the budget here and all kinds of stuff." Kenny Lofton and Corey Patterson have several things in common. Both play centerfield, hit left-handed, and have previously played for Dusty Baker. Another thing they have in common is that neither is an appreciable upgrade over the in-house options for centerfield. However, this is yet another example of Dusty loving "his guys." Kenny Lofton was a tremendous player when he was younger, but at age 41 he isn't an upgrade over Hopper and would only serve to clog up the roster and complicate the arrival of Jay Bruce. Unfortunately, it's also an example of Dusty having no appreciation of the importance of on base percentage. It's truly difficult to fathom that any professional baseball man could conceivably look at Corey Patterson and see a leadoff hitter. For his career, "C-Patt" has a line of .258/.298/.414/.712, which is hardly impressive for a #8 hitter, much less a lead-off hitter. However, he does have speed, which is clearly the attribute that Dusty feels is most valuable in a leadoff hitter. It seems very odd that you'd want someone who makes outs so frequently to get the most plate appearances of anyone on the roster, but that's what Dusty would have happen if Patterson joins the Reds. Sadly, all Reds fans can do is shake their head at Dusty just being Dusty. Unfortunately, Dusty's interest in Lofton and Patterson as centerfielder/leadoff hitter wasn't the only dark cloud on the horizon. Dusty followed it up by expressing an interest in carrying a third catcher. The Reds went down that road last year with Chad Moeller with poor results, but it seems Dusty has interest in a encore performance. Evidently Dusty hasn't studied his history, so regrettably the Reds may be deemed to repeat it. Three catchers? It's an issue that can muddy any Spring Training debate about the makeup of a final 25-man roster. The Reds already have two returning catchers in David Ross and Javier Valentin. But on Feb. 1, veteran Paul Bako, a non-roster invite, was signed to a Minor League deal. 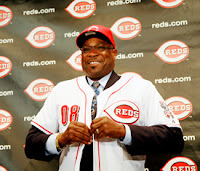 From 2003-04, Bako played for Reds manager Dusty Baker. How much did Baker like Bako in Chicago? "A lot -- that's why he's here," Baker said. Baker said it's possible the Reds could carry three catchers. "It depends on how things go," Baker said. "Late in the game, you'd love to have a guy like Bako behind the plate for a double switch or to pinch-hit. I told [general manager] Wayne [Krivsky] I'm looking for options. The more options I have, the more things you can do, the more people that can play and be put positions where they feel comfortable and succeed." Dusty is again bringing in "his guys," but the Reds cannot afford to carry a third catcher. On his career, Bako has a line of .233/.306/.315/.621 in 2,003 plate appearances. Dusty talks about wanting "options," but again it's hard to fathom how a competent baseball man could see any positive options that would be brought to the table by Paul Bako. I'm not sure if Dusty has an illogical appreciation for Paul Bako or if he wants to have a third catcher to free up Javier Valentin for late game pinch hitting, but regardless the Reds simply aren't good enough be able to get away with wasting a roster spot on a player who brings zero production to the table. The Reds need to wring every last drop of production out of each roster spot, not take the field with essentially a 24 man roster. Unfortunately, the season hasn't even started yet and Dusty is already returning to his wayward ways. Spring training is barely underway, but Dusty has already evidenced his absurd tendency to favor "his guys" over younger guys and an utter lack of understanding of the importance of on base percentage. Thankfully, pitchers and catchers have just reported, so it's still too early for Dusty to have overworked any of our young pitchers, but it's fair to wonder if that can be far behind. Some may say that it's only talk, but it's talk that is indicative of belief. And, sadly, it's incomprehensible that a professional baseball man can entertain such ideas and consider them to be truly worthy of consideration. At this point, it looks like Dusty is going to just keep on being Dusty, which is bad news for the Reds. I thought I'd take a quick look at and post some thoughts on some of the Reds prospects who just missed the cut for the top 25. These guys missed for a combination of reasons, which include age, injuries, lack of projection, or lack of stuff. However, the jury is still out, so they may yet step up and make an impact on the fortunes of the Cincinnati Reds professional baseball club. 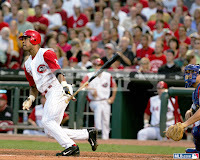 Cozart was widely considered to be the best defensive shortstop in college when the Reds drafted him out of Mississippi with their 2nd round pick in the 2007 draft. Unfortunately, his bat lags well behind his glove. Cozart has a strong, accurate arm, though he does throw from a lower arm slot than you traditionally see out of a shortstop. Cozart has been compared to Adam Everett, which immediately catches my eye, as I have tremendous appreciation for the defensive skills of Everett. However, at this point, it's not realistic to put Cozart in that class defensively. Cozart has good, soft hands, but his range is only considered a tick above average. At this point, Cozart makes all the plays that he can get his hands on, but ultimately he may not get to enough balls to make him an elite defensive shortstop. At the plate, Cozart has a lot of work to do. He is very much an upper body hitter, which limits his power and ability to drive the ball with authority. 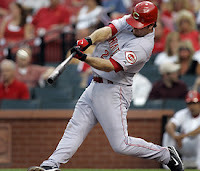 Despite his hitting approach, Cozart still has trouble making consistent contact. He struck out 36 times in 184 ABs at low-A Dayton. The Reds will be patient with Cozart, but after posting a .239/.288/.332/.620 line, it's clear that Cozart has a long road to the majors. Unfortunately, it doesn't seem like Janish is ever going to hit enough to earn a fulltime job. Janish is a very good defensive shortstop and has a rocket for an arm, but his bat continues to hold him back. Given his defensive prowess, Janish wouldn't need to hit much to justify a job, but even with the bar set so low, Janish has yet to vault over it. Interestingly enough, Baseball America just named Paul Janish the most disciplined hitter in the Reds system. I've liked Janish since watching him play in the College World Series for Rice. He made a couple of spectacular plays at shortstop and displayed the canon for an arm on several occasions. Given his plus glove, plus arm, and good plate discipline, Janish has the right tools to be of use. In fact, if he could hit just .265 at the big league level, he'd likely have a .350-.360 OBP, which when added to his defense would make him an attractive option at shortstop. Unfortunately, at 25 years old there just isn't much projection left in Janish, so regrettably he's about as good as he's going to get. Dickerson might well be the best athlete in the Reds system. Unfortunately, great athleticism doesn't always translate into great baseball skills. To be successful, baseball requires a more nuanced skillset, one which doesn't always surrender to tremendous athleticism. Dickerson joins Drew Stubbs as the best defensive outfielders in the system. In addition, he's got very good speed and on good on base skills. Unfortunately, Dickerson cannot make consistent contact. His strikeout rate remains far too high, as he struck out 162 times in just 468 ABs. If Dickerson can make consistent contact, then his batting average, on base percentage, and top flight defense will both be more than enough to earn him a starting centerfielder job in major league baseball. However, Dickerson still doesn't make enough contact to post an acceptable batting average, so he remains stuck at the upper levels of the minors. He'll be 26 at the beginning of the season, so time isn't on his side any more. Oliveras is a bit of a mystery man. The Reds nabbed him with the 289th pick of the 2007 draft. Oliveras went to the Puerto Rico Baseball Academy High School, stands 6'0", bats left, and throws right. 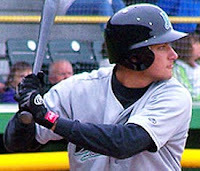 His performance in 2007 (.191/.240/.253/.493) clearly indicates that he was over-matched in his 162 ABs in the Gulf Coast League. However, there is a glimmer of hope in his scouting video. He's got a smooth lefthanded swing. Unfortunately, he needs to make some serious adjustments. He hits from a very wide stance and has a rather long swing. His bat speed isn't overly impressive, so he'll definitely need to both tighten and shorten up his swing in order to have any success against more advanced pitching. I can't quite put my finger on it, but there's just enough in his scouting video (see it here) to put him on my radar. However, at this point, he's a long shot and has a lot of work to do to even become a legitimate prospect. Time is on his side, but he'll need to show something in 2008 to stay in the Reds plans. Thompson is an interesting case. If you looked strictly at his stats, Thompson did very well in 2007. 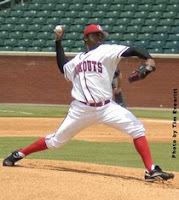 He posted a 3.18 ERA, 1.17 WHIP, and a 121/33 K/BB ratio between low-A Dayton and high-A Sarasota. However, all reports indicate that Thompson's stuff has not returned and his velocity is down significantly from where it was before his injury problems. So, his performance may have been nothing more than Thompson dominating significantly less advanced competition with below average stuff. It'll be interesting to see how Thompson does in 2008, but he'll need his best stuff to have success against more advanced competition. Tatum is an interesting prospect. 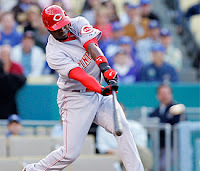 He was selected by the Reds in the 3rd Round of the 2004 draft out of Mississippi State University. He immediately fell off the radar when he required Tommy John surgery in 2005. Tatum hits with a wide stance and utilizes a leg kick as a timing mechanism. As is to be expected with a leg kick as a timing mechanism, Tatum is susceptible to quality offspeed pitches, as he gets out on his front foot too early. Tatum has a fairly simple, uncomplicated swing, which should allow him to make consistent contact and hit for a solid average. However, his swing doesn't involve a lot of lower body or explosive hip action, so his power potential is very limited. On defense, Tatum has always been solid. He's got soft hands, good lateral movement behind the plate, and a strong arm even after Tommy John Surgery. Ultimately, there is always room in the Majors for quality defensive catchers, but Tatum's bat makes it difficult to imagine him being much more than a potential backup. Baseball America slots him in at #17 on the Reds top 30 prospect list, but that seems a bit high for a player with a career line of .259/.329/.397/.726. You can see Tatum at the plate in his MLB Draft Scouting video here. Personally, I find it remarkable that the Reds farm system has come so far, so fast. It hasn't been easy, but the organization's dedication to improved scouting, player development, and international scouting has really paid off. The Reds not only have improved the chances that their draft picks will pan out, but they also improved those odds by bringing in quality prospect from their international academies. Prospects are inherently risky, so many of them will never pan out. However, the international academies greatly increase the flow of talent headed for the majors. The Reds no longer have to rely solely on the select few impact prospects they get in the amateur draft each year, but rather double that number by bringing in talent with international free agents. The greater the number of quality prospects, the greater the number of homegrown Major League players. All in all, things are looking very bright for the Reds farm system. Well, good news, Reds fans. The Reds did what they needed to do and locked up Brandon Phillips to a multi-year contract. Earlier this offseason, the Reds and Phillips exchanged arbitration figures. Given Phillips' performance in 2007 and the discrepancy between the figures, it was fairly clear that the Reds were going to lose. 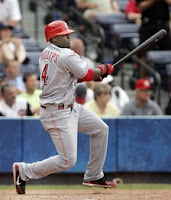 The Reds offered $2.7M, while Phillips countered with $4.2M. While I do think his 2007 season is being overrated a bit, it's hard to deny that a 30/30 season from a middle infielder would speak very loudly in an arbitration hearing. Given all that, one has to wonder if the lowball figure the Reds tossed out was designed to signal Phillips that they wanted to get a longterm deal done. It seems like a pretty clear indication that they weren't going to seriously contest the arbitration, but rather were willing to pay Phillips what he deserves. Whatever the reason for the low arbitration offer, the Reds made it a moot point by locking Phillips up to a 4 year contract with a team option for a 5th year. Under the terms of the deal, Phillips gets a $750K signing bonus with salaries of $2.75M in 2008, $4.75M in 2009, $6.75M in 2010, $11M in 2011, and a team option for $12M in 2012. Overall, it seems like a good deal for the Reds. When you include the $750K signing bonus, his 2008 salary is just about the midpoint between the arbitration figures. In addition, if Phillips can maintain something approximating his 2007 level of performance, then it would seem likely that his annual salary in each year of the contract will be below market. If Phillips was a free agent this offseason, then he'd likely be in line for a 2008 salary in the neighborhood of $9-10M, so getting him under contract for $11M in 2011 and $12M in 2012 could be a very good deal. On average, salaries increase ~10% per year in MLB, so the Reds are getting his first two free agency years at a well below market rate. Contracts in Major League Baseball are all about risk. Since the contracts are guaranteed, a player is assured of receiving his money regardless of future performance or health. Accordingly, the longer the length of the contract, the higher the risk being assumed by the team. If a player gets injured in the future or suffers a decline in production, then the team is overpaying for the production they receive. The shorter the length of the contract, the higher the risk being assumed by the player. If a player accepts a short-term contract, then his risk is higher because he isn't guaranteed any money if he gets injured. This seems to be a good deal for the Reds, as they limited the risk they assumed by not guaranteeing the 5th year and are likely to be paying below market rates in each year. While the deal itself is a good one for the Reds, it does add another data point to what is a potentially disturbing trend. One has to wonder about the wisdom of signing a player who is under control for three more seasons to a longterm contract right after he has a career best season. 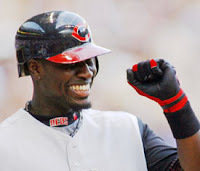 The Reds did something similar with Bronson Arroyo and now they've done it again with Brandon Phillips. Overall, it's a good day for Reds fans, but let's hope the Reds put an end to negotiating long term contracts on the basis of career seasons. Here's a quick look at Adam Rosales at the plate. Thanks to "farmsystem" on youtube for posting the video clip. It's hard to argue with Adam's success as of late, but his MLB career still seems like to hinge on whether he can move back up the defensive spectrum to a more challenging defensive position. His bat is good for a middle infielder, solid for a third baseman, but below average for a first baseman. If Rosales is over the elbow problems that precipitated his move from shortstop all the way down to first base, then maybe he can move to a defensive position where his bat will be more valuable. It'll be very interesting to see how the farm system shakes out, as the Reds are collecting a significant number of prospects who play the corner positions, so something will have to give. 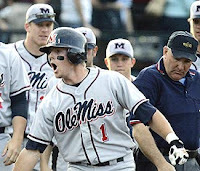 The 2008 season will reveal much about how things will shake out. I just came across this news story about Reds pitching prospect Kyle Lotzkar and thought I'd share it. Evidently, Lotzkar is working out at Advanced Athletics, which given the accents, I would say is back in Lotzkar's home country of Canada. Thanks to "stabilizertraining" on youtube for originally posting the news clip. It appears that Lotzkar has a very good work ethic and a real dedication to improvement, both of which are great attributes for prospects. Especially given his age, Lotzkar seems to have a good head on his shouders and maturity beyond his years. All too often, you see sublimely talented prospects who fail to get the most out of their natural ability, but thankfully that doesn't seem to be the case with Lotzkar. I still have some concerns about his mechanics and his repertoire, but at least he's serious about his offseason workouts. 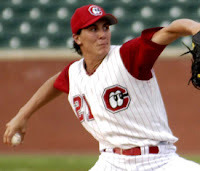 I have to wonder if the Reds as an organization wouldn't benefit from implementing a "pre-hab" program for their pitchers similar to what the Oakland A's and others have done. However, until that time, we have to hope that Lotzkar's offseason workout program will improve his velocity and decrease his injury risk. It'll be a very interesting 2008 season for a number of the Reds prospects. The 2008 season is "moving day" in the Reds organization, so it'll be interesting to see who rises and who falls.